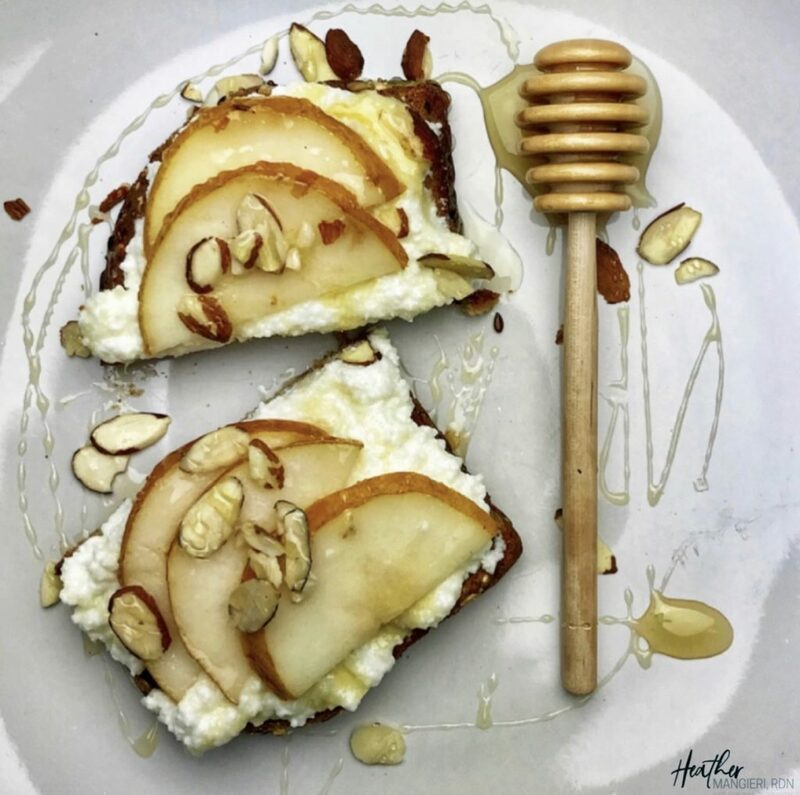 This ricotta and pear on pumpernickel toast offers a unique flavor combination, sure to satisfy your taste buds. All that flavor in one quick and balanced snack. I’ve been eating a lot of pumpernickel bread, lately. It started with the creation of my Roast Beef and Slaw on Pumpernickel Sandwich I made last year. Prior to making that recipe, I had forgotten how much I loved the flavor. Since then, I can’t get enough. I’ve been on a toast kick lately. It seems many of you love protein-packed toast, too. I received loads of feedback about my Ricotta and Blackberry Toast. Many people never considered ricotta cheese as a toast topper. I love when I get feedback like that. Being able to share new, quick and easy ideas to help you eat better on the go is why I do this. I thought it was time to share another favorite. 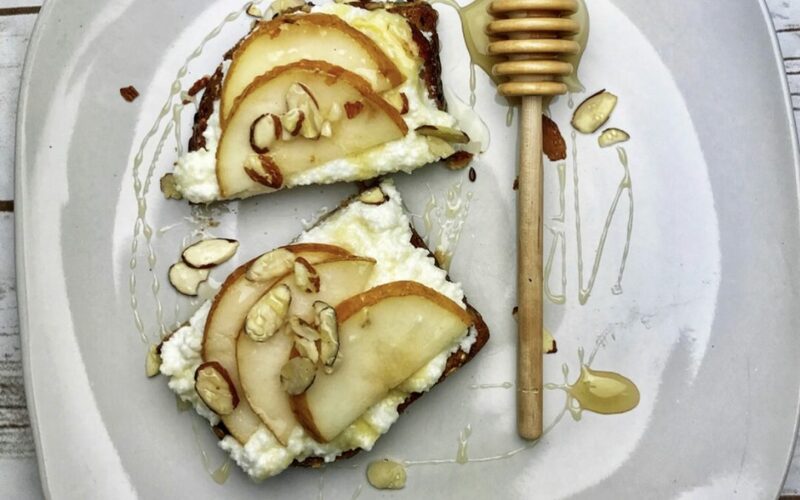 This ricotta and pear on pumpernickel toast has all of the nutrition as my other flavorful combinations, (try this ricotta and blackberry toast) but the pumpernickel adds a rich flavor that wheat bread doesn’t deliver. Give this combo a try and let me know what you think. Toast Pumpernickel bread. 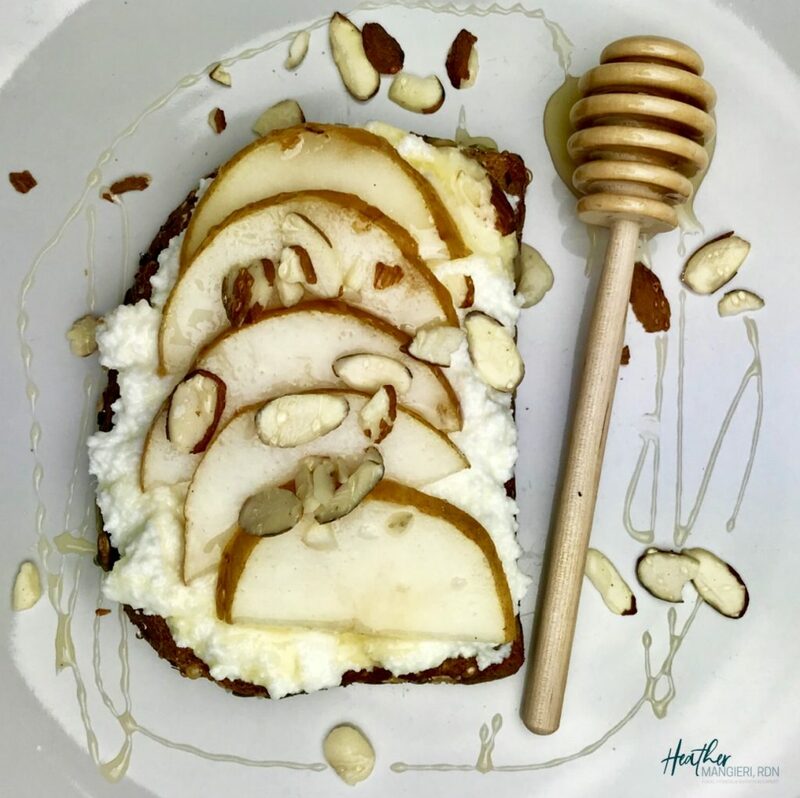 Spread with ricotta cheese, top with sliced pear and almonds, then drizzle with honey. Serve warm.